At the core of the 150cc engine is a reworked cylinder. It has a 58 mm bore and features an improved power valve unit with a sophisticated mechanism for the lateral support exhaust ports. The new exhaust port layout increases engine performance, while the upper contour of the exhaust port has been machined to ensure more accurate port timing. 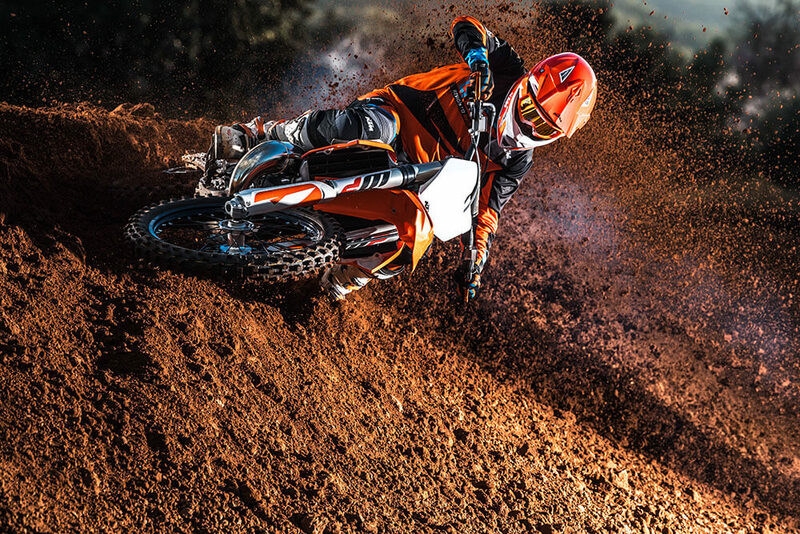 Together with the two-component cylinder head, the cylinder is key to the KTM 125 SX's outstanding performance across the entire rev range. The lightweight and compact engine cases are manufactured using a high pressure die-cast production process that reduces weight, whilst retaining strength and durability. The design allows for a higher crankshaft position which is located closer to the center of gravity, resulting in optimal mass centralization and easier ride-ability. Additionally, for 2019 the seat of kickstart intermediate gear has been reinforced for improved reliability and thanks to the new clutch arrangement, the clutch cover is lower, reducing the engine width by 10 mm. 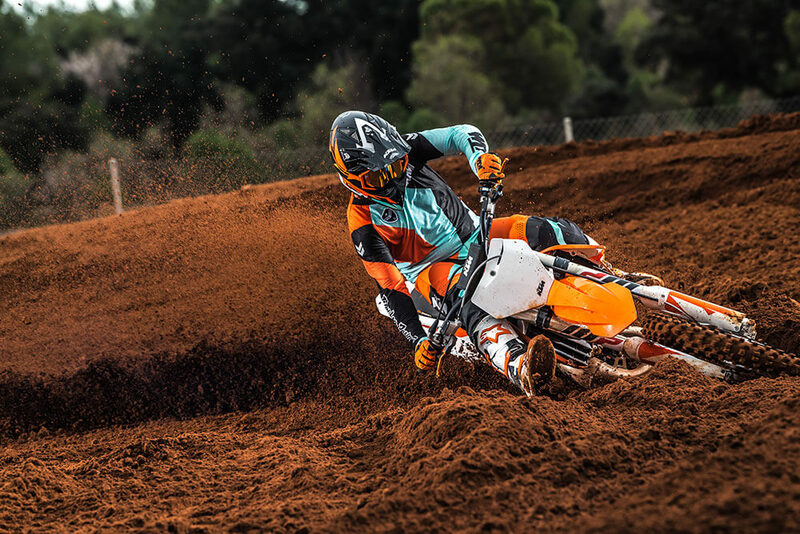 The KTM 150 SX is now fitted with a new, more robust 6-speed transmission. The gear ratios were carried over from the predecessor, but all the gears feature improvements and reinforcements. Another highlight of the 150 SX transmission is the no dirt gear shifter. Similar to the foot peg design, it prevents the build-up of dirt and ensures the next gear is always available, no matter what the conditions. The KTM 150 SX is fitted with a MIKUNI TMX carburetor. This 38mm flat slide carb lives to provide smooth and controllable power all the way up to the rev limitation. With a new intake manifold the carburetor is turned 7° in order to reduce the overflow of fuel. And it's less sensitive to different altitudes and temperatures, so you can pin it wherever, whenever. Maintaining the optimal engine temperature is crucial to ensuring consistent horsepower throughout the ride. 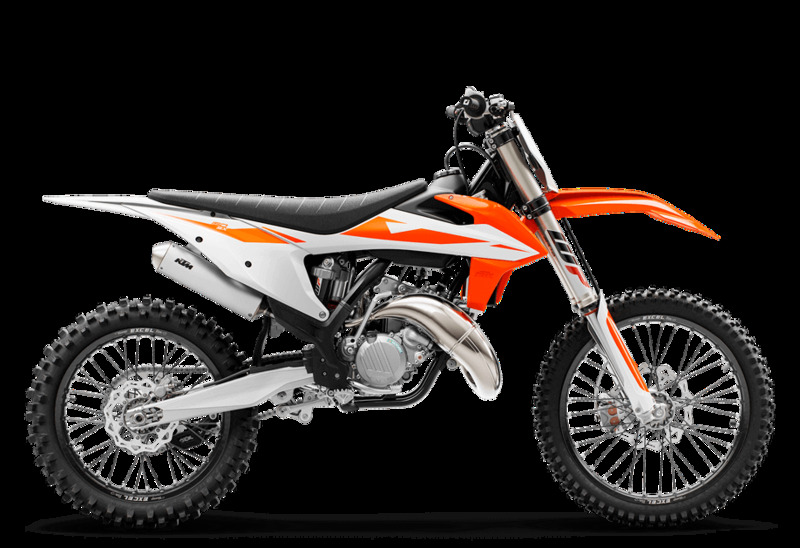 The KTM 150 SX features newly designed radiators which are mounted 12 mm lower than the predecessors. This lowers the center of gravity and matches the design of the new shrouds perfectly, in order to achieve perfect ergonomics. By using CFD technology (computational fluid dynamics) together with a clever coolant circuit routing, the innovative system ensures the optimum engine temperature for the highest performance, no matter what the conditions. The radiators also feature special protectors that don't only serve as protection from flying rocks and debris but also as a brace that disperses energy around the radiators in the event of an impact. 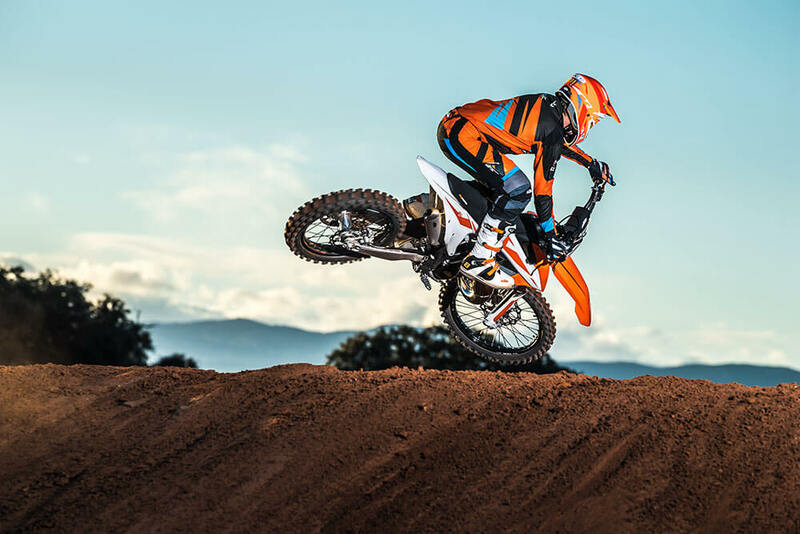 The all-new KTM 150 SX frame is professionally crafted from hydro formed Chromium Molybdenum steel tubes that are robot welded, ensuring the highest levels of consistent quality. With improved stiffness for more responsive handling, while working in total harmony with the suspension, for uncompromised high-speed stability. The frame also features "no-dirt" footpegs which have a simple but effective self-cleaning system that ensures the footpegs return to their original position, providing complete control in all conditions. 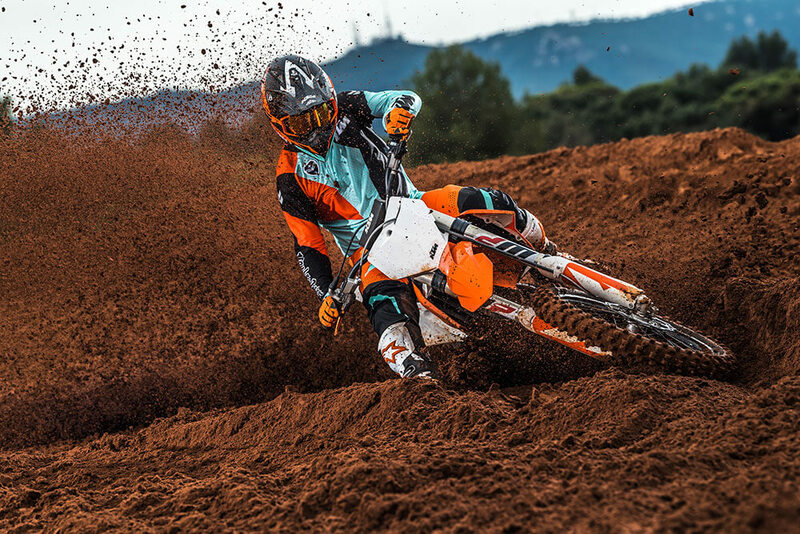 For 2019, all SX frames feature the same highly durable powder coating as the KTM Factory machines and come with standard frame protectors. A new 40 mm longer lightweight aluminum subframe ensures better rear fender stability. The KTM 150 SX features an improved one-piece swingarm, with 5 mm of extra axle adjustment thanks to a reshaped axle slot. This allows the wheel to be set further back, for increased stability on the roughest tracks. Manufactured using a gravity die-cast production process, it offers exceptional strength at the lowest possible weight. The chain measurement markings on the swingarm are visible from above, making chain adjustment simpler and more accurate. The new airbox on the KTM 150 SX has been completely reworked to ensure better flow dynamics, resulting in optimal power and throttle response. Despite the obvious performance enhancements, the new design also offers maximum protection against soiling of the air filter. The large Twin-Air air filter is mounted on a cleverly designed stiff cage that minimizes incorrect installation. As found on previous models, filter maintenance is quick and easy and does not require tools - a standard, original feature from KTM. All full-size SX models are equipped with the same high-strength aluminum tapered handlebar, made by NEKEN. The handlebar is fixed in rubber damped mountings, which allow for two different positions. The handlebars come standard with an ODI vulcanized grip on the right side and a comfortable ODI lock-on grip, which does not require any wire or glue, on the left. They also feature a reworked bar-pad with a newly designed cover that can be attached and removed a lot quicker and easier. These handlebars offer the control a 150cc rider is looking for, allowing him to ride it like a 125 and still hang on to the little extra power. Sophisticated Â´No DirtÂ´ footpegs prevent smudging up the pegs, even when digging in deep ruts. Looking for a higher riding position? Then just mount the footpegs of the MY2018 EXC models, which are 6mm higher than the SX versions.